Oil prices have moved very little in the past month closing on Friday at $52.72 in NY and $62.10 in London or about where they were in the first week of January. Several factors such as the recent price drop, the OPEC+ production cut, the US sanctions on Tehran and Caracas, and the outage of Libya’s largest field should be pushing prices higher. However, concerns about slowing global economic growth, the US/China trade dispute, and the possibility of turmoil resulting from the UK’s exit from the EU suggest that the demand for oil could drop significantly in the coming year. The US-China trade dispute is still the most important factor as we are only two weeks away from higher tariffs coming into effect. President Trump said last week that he would not meet Chinese President Xi before the March 1 trade deadline. Such a meeting would be an indication that the US and China were close to reaching a deal. Trump has promised to hike tariffs on $200 billion worth of Chinese imports from 10 to 25 percent. White House economic advisor Larry Kudlow said that there is a “pretty sizable distance” to go on the trade talks. Last week, the European Commission sharply cut its forecasts for eurozone economic growth due to global trade tensions, an array of domestic downturns, and the possibility that an unregulated Brexit will result in chaos. The OPEC Production Cut: The cartel’s oil production fell by nearly 1 million b/d from December to 30.86 million b/d in January, marking the lowest output for OPEC since March 2015. The monthly drop in the cartel’s crude output was the steepest since December 2016. Saudi Arabia’s oil production in January stood at 10.21 million bpd, or 100,000 b/d below its pledged ceiling of 10.311 million b/d, and the lowest Saudi production since May 2018. Much of the 1 million b/d production drop is from Libya, Venezuela, and Iran where the output is dropping for geopolitical reasons and not from the attempt to force prices higher. As the Venezuelan situation deteriorates, we can expect further production drops this month. Indeed, much of OPEC’s apparent success in lowering production over the last few years is due to geopolitical problems for some of its members which resulted in lower production. Should the situation get worse, much of Caracas’s roughly 1 million b/d of oil production could come to a halt. The relationship between US lawmakers and two of President Trump’s staunchest supporters, Saudi Crown Prince Mohammed bin Salman and Abu Dhabi’s Sheikh Mohammed bin Zayed, is worsening. Legislation that aims to prevent OPEC from coordinating production and influencing oil prices is advancing on Capitol Hill. On Friday at least one senior Trump administration official expressed support for the legislation, signaling a potential change in the decades-old White House opposition to the measure. The bills would make it illegal for foreign nations to work together to limit fossil fuel supplies and set prices. They would authorize the US Justice Department to sue oil producers for antitrust violations by stripping foreign actors of sovereign immunity protections. Barclays said last week that the passage of NOPEC legislation could see the oil market return to a period of instability. Saudi Arabia and its Persian Gulf allies are backing a formal partnership with a 10-nation group of oil exporters led by Russia, according to OPEC officials. Such a formal alliance would transform the nature of the 60-year-old cartel. The cartel is facing pressure from President Trump to keep prices low and the increasing flow of American shale oil. TASS news agency cited Russian Energy Minister Alexander Novak as saying last week that OPEC and non-OPEC countries could discuss a charter outlining open-ended cooperation in April. Reuters is reporting that Igor Sechin, head of Russian oil giant Rosneft, has written to the Russian president saying Moscow’s deal with OPEC to cut oil output is a strategic threat and plays into the hands of the United States. Forecasters had been projecting a substantial increase in US oil production in 2019. The size of this increase ranged from four hundred and twenty thousand b/d (Citibank) to 1.7 million (OPEC) with the most recent IEA forecast coming in with an increase of almost eight hundred thousand b/d. The optimism expressed in these forecasts is understandable when considering just how spectacular the production in US shale oil regions has been. The most recent EIA drilling productivity report on US shale oil production sees an addition of only 62,000 b/d to 8.17 million b/d this month. Given the extremely cold weather in North Dakota in the past few weeks, the chances are that production in the Bakken will fall in February rather than grow when the actual output for February becomes available in mid-April. The US shale oil industry is changing. The immediate problem is the low price of oil resulting from the 30 percent price drop last fall. In North Dakota, the wellhead price for crude fell from $58.43 in October to $26.25 in December before rebounding to about $36 in January. This is the same oil that went s high as $136 a barrel back in the summer of 2008. Add to the low-price problem, the shortage of pipeline capacity (albeit temporary) to move oil out of the US most productive Permian Basin and you have cash flow problems for many of the small producers that have dominated the industry for the past decade. In the last few years, however, large oil companies such as Exxon and Chevron have entered the shale oil business in a big way. These giants do not have the problems of the smaller drillers. Their cash flows from conventional oil are so large that they can afford to lose a bit on the production of shale oil. As integrated companies, they can make money on downstream activities, such as transportation, refining, and retail to offset any losses on shale oil production (if any). These companies maintain that the size of their operations can lead to so many efficiencies that they can make money where smaller companies fail. They do not need to beg investors for more capital to keep drilling, nor do they need to cook the books to make shale oil drilling look profitable. In recent weeks, we have started to see some of the consequences of lower prices. Liberty Oilfield Services estimates that roughly 20 percent of the hydraulic fracturing fleets that were active in mid-2018 have now been idled or are being idled, as producers to tighten their budgets. This report is backed up by estimates that the cost of fracking sand used in the Permian will fall by 19 percent this year due to lower demand. Sand pricing is important for drillers because fracking is the most expensive phase in drilling a shale oil well. How much the US shale oil industry will grow in the next five years is an open question. Given the rapid depletion of shale oil wells, the industry must constantly drill to replace depleted wells. In the older Bakken and Eagle Ford shale oil regions, new production is just barely ahead of the decline in production from older wells. The situation in the Permian where production is now on the order of 3.8 million b/d, is not far behind. As production grows, the depletion problem grows so that someday soon, the industry will not be able to keep up and production will start to fall. Germany, France, and the UK have set up a special payment channel to handle trade with Iran that would allow transactions with Iran, including oil, as the EU still tries to salvage the nuclear deal with Iran. Iran has recoverable crude oil reserves of 160 billion barrels according to the National Iranian Oil Company. Recoverable natural gas reserves came in at 33.33 trillion cubic meters. This data, according to the Iranian media, makes Iran the third-largest holder of oil and gas reserves after the United States and Russia. Syria/Iraq: US withdrawal of its troops from Syria will not give Islamic State an opportunity to retake oil fields in the war-torn country, US Secretary of State Mike Pompeo said last week. In September 2017, U.S.-backed Syrian forces seized the Conoco gas plant from Islamic State in the Deir Ezzor area, depriving the militants of an important revenue source. In August 2018, the second-largest oil field in Syria, the Tanak field in the Deir Ezzor region, restarted after U.S.-backed Kurdish forces recaptured the field from ISIS. The Tanak field, which has around 150 wells and the capacity to produce up to 40,000 b/d, was captured from the Islamist militants by the Syrian Democratic Forces in November of 2017. Iraqi crude sales in January hit their second-highest monthly average ever, as the federal government and the Kurdistan Regional Government combined to sell 4.081 million b/d. Basra Oil Co., the state-owned operator of the Majnoon field, plans to boost production from it to 450,000 b/d by 2021 by drilling 40 new wells. This project would be more than double Majnoon’s current production, which averages 240,000 b/d. The 40 new wells will be in addition to another 40 already contracted to Schlumberger last month. Basra Oil Co. took over Majnoon last year, after Shell, the previous operator of the field, pulled out. Kurdistan’s two dominant political parties have made a breakthrough in their long-running negotiations to form the next Regional Government. Under the agreement, the new KRG Parliament will meet for the first time on Feb. 18, paving the way for Masrur Barzani – currently Kurdistan’s intelligence chief, and the son of former President Massoud Barzani, who leads the Kurdistan Democratic Party – to become prime minister. Saudi Arabia: The government has backed up the pledge of its energy minister Khalid al-Falih to slow oil output, with January production falling to 10.21 million b/d – down 400,000 b/d from December. The January figure is below its allocation of 10.31 million b/d under the production cut deal, and crude exports declined by around 500,000 b/d to 7.20 million b/d in January. This was the lowest output figure since May 2018 when the kingdom produced 10.01 million b/d. The Trump administration is confident that the Saudis will fill any oil supply gap caused by US sanctions on Venezuela. White House officials are “certain” that Saudi Arabia will boost crude exports to the US in coming weeks, but Saudi officials have indicated no such plans, with OPEC in the midst of a production cut accord aimed at boosting oil prices. The Saudis have stepped up efforts to woo investors disturbed by the killing of journalist Jamal Khashoggi, as it seeks to raise more than $426 billion in private capital to modernize its economy. Officials say the government said it would offer financing and other unspecified incentives to local and international investors to help develop its mining, logistics and manufacturing sectors. The new plan, dubbed the National Industrial Development and Logistics Program, is part of Crown Prince Mohammed bin Salman’s ambitious social and economic overhaul announced in 2016. Since then, Saudi Arabia has introduced new laws and created funds to invest jointly with international companies to attract foreign cash to diversify the economy away from oil. However, the departure of more than 1 million foreign workers since 2017 has added to a sense of uncertainty. Workers from Asia and the Middle East, often on short-term contracts, have provided the labor to fulfill the Saudi government’s ambitious development plans for decades. Recent shifts in government policy, however, have imposed fees on the dependents of expatriate workers and restricted foreigners from working in certain sectors. Rising costs have hit low-wage foreign workers especially hard, forcing many from the country. A vital part of the new government development plan involves creating employment for Saudi citizens in the private sector, where jobs are overwhelmingly held by foreigners. In the short term, though, Saudi citizens have not filled the positions that expatriates are vacating, adding to the pressure on business. Libya: The Libyan National Army—a militia led by Khalifa Haftar, whose forces control the eastern part of the country—took over the giant Sharara oil field last week according to an official at Libya’s National Oil Corp. The Sharara facilities, which can pump 315,000 b/d, about a third of Libya’s normal output, were shut down in early December by a small group who demanded better living conditions in the region. On Friday, however, the National Oil Corp. said military clashes near the Sharara oil field have made conditions unsafe and production isn’t likely to restart soon. There is growing concern over China’s economic growth. If the slowdown continues, it will threaten economic activity around the world. Growth in the German economy has already cooled in part due to its exports of machinery to China dropping precipitously. Beijing’s economic growth has been a key driver of global crude oil consumption accounting for one-third of the IEA’s projected increase in global oil consumption for 2019. Lower oil demand growth in China comes just when independent refining capacity there is rising. As demand slows, these independent refiners will begin to dump oil products abroad to earn hard cash. In doing so, they could plunge the global refining industry into a recession and drive down crude prices. The White House said Friday that deputy-level talks would start Monday in Beijing, followed by high-level talks February 14-15 attended by US Trade Representative Robert Lighthizer and Treasury Secretary Steven Mnuchin. The next round of talks that could signal whether crude and LNG flows will pick up between the two countries this year or remain mired in the trade war. The talks come just two weeks before the next potential round of tariff increases. US crude exports to China disappeared in August, after hitting 510,000 b/d in June, with none reported through November. China’s LNG imports broke another record last month amid rising stockpiles that are making importers nervous. The January total reached 6.55 million tons, up by 2 percent from the previous record set in December. However, the winter turned out milder than would justify this scale of LNG imports so that some importers are stuck with more LNG than they can sell. Imports of LNG rose by 41 percent throughout 2018, as China sought to prevent a repeat of the 2017 gas shortage that left several million households in northern China without heating. China’s state energy companies plan to increase spending on domestic drilling this year to the highest levels since 2016, focusing on adding natural gas reserves in a concerted drive to boost local supplies. Responding to President Xi Jinping’s call last August to increase domestic energy production, China’s of oil majors are adding thousands of wells at oil basins in the remote deserts of the northwest region of Xinjiang, shale rocks in southwest Sichuan province and deepwater fields of the South China Sea. In a new twist, the Chinese are planning to apply the technology used to detonate nuclear bombs to access its massive shale gas reserves in Sichuan province. According to the South China Post, scientists have developed an ‘energy rod’ that can fire multiple shock waves to frack sedimentary rock at depths of up to 3.5km. While China is supposed to have the world’s largest reserves of natural gas, it is found so deep underground that the current fracking technology cannot be used. The first field test is to take place in Sichuan in March or April. The test could be a dud, producing little or no gas; it could be a breakthrough in gas extraction technology making China energy independent; or it could trigger earthquakes as the tests are taking place in seismically active regions of China. PetroChina is looking to drop Venezuela’s state-owned oil firm PDVSA as an equity partner in a planned and long-delayed US$10-billion oil refinery and petrochemical complex in southern China. The plan to dump the ailing Venezuelan oil firm is a result of the continuously deteriorating finances of Venezuela’s oil company in recent years. Gazprom has not been able to obtain a loan from the China Development Bank for part of the $14 billion financing the company aims to raise for the construction of its Amur gas processing plant, which will be Russia’s largest. Gazprom will use bridge loans for the construction of the Amur plant, but these will not come from the Chinese Development Bank. Moscow says it could reach an agreement with the Chinese over the terms of the loan. Oil output declined to 11.38 million b/d in January, or by around 35,000 b/d from the October 2018 level — the baseline for the global oil accord. Alexei Sazanov, head of the finance ministry’s tax department, said Russian oil production has not yet reached its peak and expectations that it could decline in the next few years are not justified. Sazanov also said the government would take necessary steps if it saw risks of a decline in oil production. Russia’s energy ministry said earlier that Russian oil output could fall significantly in the next few years if some tax and other measures are not taken. US oilfield services giant Schlumberger said on Tuesday it would continue looking for alternative ways to work in Russia’s onshore drilling market despite its bid for Eurasia Drilling Company (EDC) falling apart. Russia’s Federal Anti-monopoly Service said on Monday that Schlumberger had withdrawn its bid for a stake in EDC, one of the largest private drilling companies in the country. Republican and Democratic US senators unveiled a resolution calling for the cancellation of Russia’s Nord Stream 2 natural gas pipeline. Leaders of the Senate Foreign Relations Committee said they would take up the resolution at their next business meeting. Opponents of the pipeline worry it will weaken support for Ukraine by depriving Kiev of gas transit fees along the traditional route for Russian supplies, which meet more than a third of the European Union’s gas needs. Events have been moving rapidly since the US imposed sanctions on Caracas two weeks ago, cutting off the oil and product flows between the two countries and making it difficult for Venezuela to sell its oil elsewhere. Venezuela is preparing to shut down more than a quarter of its oil production in the coming weeks, with US sanctions preventing PDVSA from importing diluent needed to extract its extra-heavy crude. Sources at PDVSA say the company expects it will not be able to produce some 300,000 b/d of diluted crude oil without supplies of naphtha that are blended with the thick crude from the Orinoco Belt to make it transportable. As a result, Venezuela’s total oil output will fall to below 800,000 b/d by the end of February from the estimated 1.17 million b/d the country pumped in December. PDVSA is looking to sell more of its oil to customers in Europe and Asia as the US sanctions are cutting off US buyers. They were exporting about 500,000 bpd to the US but will redirect exports to other customers in Europe and Asia. As of last week, PDVSA and oil traders were having trouble finding customers with refineries that can handle the heavy oil outside of the US. These exist in China, but the transportation costs are high. 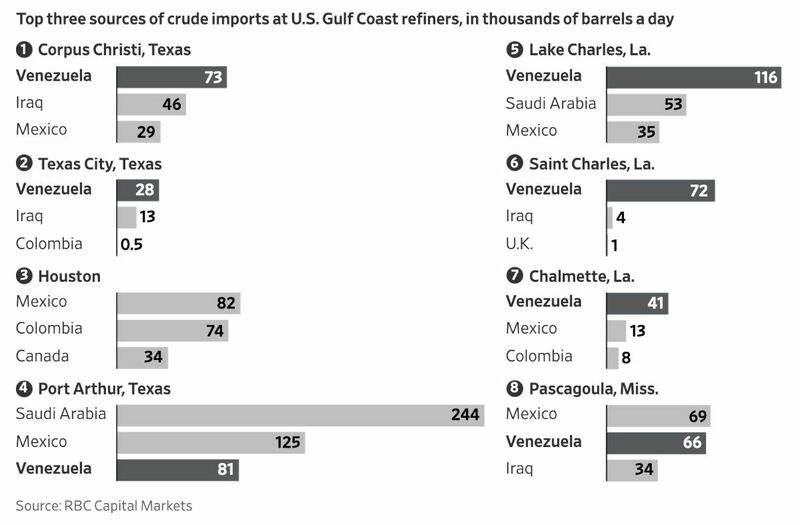 Tankers carrying about 7 million barrels of Venezuelan oil are sitting in the Gulf of Mexico, some holding cargoes bought ahead of the latest US sanctions on Venezuela and others whose buyers are weighing who to pay. Venezuela’s domestic refineries remain mostly idle due to lack of crude supplies and damaged equipment, with rampant fuel shortages in the country. PDVSA began partial rationing of gasoline at gas stations in some regions on Sunday, as many gas stations in Caracas ran out of fuel as customers nervously filled up their tanks in anticipation of shortages. Russia has stood by the Venezuelan leader for years and has poured billions of dollars in the Latin American country in the form of loans and oil investments, even when all other Venezuelan allies—including China—have shown reluctance to continue lending money to Maduro’s regime. Rosneft is reportedly sending some oil products to Venezuela to keep production from collapsing; however, sources in Moscow say the government is becoming pessimistic that it can save the Maduro government in the current crisis. The international effort to rush food and medicine into Venezuela is becoming a high-stakes standoff between President Maduro and the U.S.-backed opposition, essentially holding hostage lifesaving shipments of humanitarian aid at the border. Maduro has defiantly vowed to block more than $60 million worth of assistance organized by the opposition and provisioned by the United States, Colombia, Canada, and other countries. Even as truckloads of aid from the United States began arriving at warehouses at the border crossing of Cucuta, Colombia, Maduro loyalists pledged to use force to keep it out.